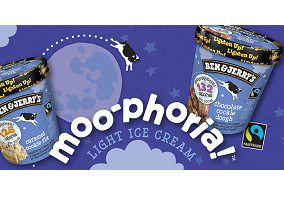 Ice cream maker Ben & Jerry’s, a subsidiary of FMCG multinational Unilever, has announced the launch of Moo-phoria, a range of ice cream that is described as low in both calories and fat. Advertised as ‘ice cream without compromise’, the Moo-phoria line is available in the USA in the varieties Chocolate Milk & Cookies, Caramel Cookie Fix and PB Dough, while in the UK the brand is being launched in the varieties Chocolate Cookie Dough and Caramel Cookie Fix. Varieties contain between 128 and 160 calories per half cup. 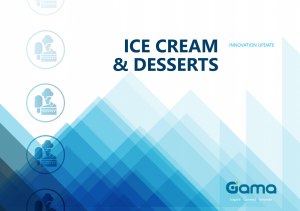 Commenting on the launch, Dena Wimette, senior innovation manager at Ben & Jerry’s, said: “Ben & Jerry’s tries to offer a little bit of something for everyone. We’re excited to have an incredible new option for our fans who say they can’t be trusted with a pint of Ben & Jerry’s in their freezers”. Advertised as containing between 60% and 70% less fat than regular ice cream, Ben & Jerry’s Moo-phoria is claimed to be made from organic milk and cream while also featuring the brand’s “famous chunks and swirls”. In the USA, the product line is being sold with an RRP of $4.89.